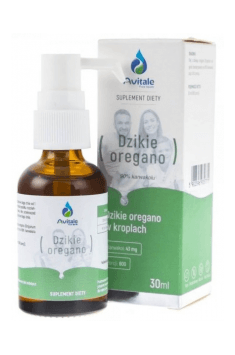 Avitale Wild Oregano 90% Carvacrolu is a diet supplement containing high quality oil form wild oregano in drops, standardized to have 90% carvacrol. This exceptionally high standardization was possible to be achieved thanks to applying rectification process. The formulation contains only natural carvacrol as opposed by popular mixtures of both natural and synthetic oil. This product is in the convenient to use bottle with a dispenser. Carvacrol is one of the main ingredient of wild’s oregano etheric oil (Origanum vulgare), also known as common pigweed. This compound is responsible also for the characteristic smell of the plant. Carvacrol demonstrates strong antibacterial and antifungal activity. Formulations based on carvacrol are used for years in traditional medicine in therapy of systemic and surface infection. Carvacrol has been shown to have the ability to inhibit the growth of i. a. strains of Escherichia coli and Bacillus cereus and impede the division of Pseudomonas aeruginosa. Carvacrol has anti-inflammatory properties. It is capable to inhibit the activity of cyclooxygenase 2 (COX-2), enzyme conditioning the creation of proinflammatory prostanoids from arachidonic acid. Impeding cyclooxygenase is a work mechanism of popular painkillers, anti-imflammatory and antipyretic drugs form the NSAIDs (Nonsteroidal Anti-Inflammatory Drugs) group. In the 2012 research the conclusion was drawn that carvacrol has the proapoptotic effect on the prostate cancer cells. Follow-up research (conducted on animals) from 2015 has shown that in the right doses carvacrol was reversing previously induced carcinogenesis. However, this requires further, more precise research. Wild oregano has antioxidative properties. Its owes this effect mostly to the presence of rosmarinic acid – a phenolic compound of a broad spectrum of activity. Apart from strong anitioxidative properties this compound has also anti-inflammatory and antimicrobial activity, stabilizes the cell membranes and protects form UV radiation. To sum up, Avitale Wild Oregano 90% Carvacrol is a diet supplement with positive, pro-health properties on the organism. It supports the antioxidative barrier, resistance, reduces inflammation states and has an antimicrobial activity. Servings of the product recommended for daily consumption necessary to obtain beneficial effects: Dilute 1-3 servings of product in water or olive oil. Do not exceed the recommended daily portion. Precautions: Consume with a meal. Do not use undiluted oil! Diluted oil form wild oregano can be used also locally on the skin in different kind of ailments, i. a. infections but also to improve the skin condition and tone. Oil from wild oregano, due to its strong antioxidative and anti-inflammatory effects, is going to be an excellent cold prophylactic, especially in the fall-winter season. It can be helpful in faster recovery to health during the cold. Avitale® is a line of products made by the Polish pharmaceutical company MedicaLine, established in 2007. The fact that the preparations of this brand are of the highest quality is supported by the company’s specialisation in the production of hospital medications. Dietary supplements Avitale® are available in the form of high-quality vitamin drops. The preparations have a “clean label”, which means that they contain no unnecessary additives. The bioactive forms of vitamins are suspended in organic, first cold-pressed olive oil and natural vitamin E. A bottle with an accurate dropper makes it possible to administer a precise dose of the product. The preparations are free of gluten, milk and soy. Dietary supplement lowering the level of homocysteine in the organism.